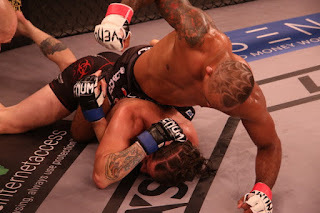 LFA brought their fights to Atlantic City, New Jersey last weekend which made for a big MMA weekend in The Garden State with the MMA Pro League making their inaugural event debut. AXS TV brought their Friday night fights that had a former WWE "Tough Enough" star fall to Jonavin Webb in the co-main event of LFA 49. Webb has a strong fan base in New Jersey and the east coast MMA scene so securing a win in Atlantic City is always memorable. Main Event - Welterweight Fight - Sean Brady (9-0) defeated Gilbert Urbina (5-1) via unanimous decision (30-27. 30-27. 30-27). Co-Main Event - Welterweight Fight - Jonavin Webb (11-2, 1 NC) defeated Tanner Saraceno (7-3) via unanimous decision (30-27, 30-27, 30-27). Featherweight Fight - Andy Main (12-3-1, 1 NC) defeated Saul Almeida (19-10, 1 NC) via unanimous decision (29-28, 29-28, 29-28). 175-pound Catchweight Fight - Stephen Regman (9-3) knocked out Wilfredo Santiago (9-6) at 4:34 in round one. Featherweight Fight - John De Jesus (10-6) defeated Adi Alic (7-4) via unanimous decision (30-27, 30-27, 29-28). Bantamweight Fight - Ahmet Kayretli (8-2, 1 NC) defeated Andrew Salas (5-2) via unanimous decision (29-28, 29-28, 29-28). 160-pound Catchweight Fight - Dakota Bush (5-1) submitted Patrick Rivera (2-2) with a rear naked choke at 4:49 in round three. It was not all good news for New Jersey Saturday though but it was good news for MMA with the very first MMA Pro League event that had Team New Jersey face Team Pennsylvania Saturday night. While New Jersey has a strong history with innovation in modernizing MMA from the days with no rules, Team Pennsylvania led by head coach Daniel Gracie defeated Team New Jersey led by head coach Dan Miller by a score of 14 - 6 at the Hard Rock Hotel & Casino Atlantic City and on FloCombat.com. The win gave Team MMA Coach Daniel Gracie a good platform to not only talk about how far the sport has come but looking at where it needs to go. While media likes to refer to MMA as "the fastest growing sport", even with the popularity it has now it still has a way to go. "The way we won showed me a lot about my team," said coach Gracie. "We won decisively and showed the type of performance that I've come to expect from my guys. MMA Pro League president Mark Taffet spoke with the Coast-2-Coast Combat Hour about the future of the promotion earlier this month and let fight fans know The Hard Rock Hotel & Casino in Atlantic City is sure to bring more of their team based action in the future.